Does Anyone Really Benefit From Working With A Bad Boss? A while ago, I walked into a bank hall to perform some transactions. While waiting for my turn, I saw a man walk towards a couple of workers and then start liberally handing out criticisms, right there in front of everyone! From the look on the faces of the workers, this was a very regular experience, one they had come to expect and loathe. You could have walked into that bank, informed employees that you have another opportunity in a financial institution, but with less pay and a friendlier atmosphere, and have half of the branch employees turn in their resignations right that afternoon. I understand where these articles come from. Many people actually have to work under bad bosses, and writers usually look for such common issues to write about, with the aim of providing some relief, and of course, getting more traffic to their website. However, there are articles and topics that should left alone, including any about how working with a bad boss can be good for you. Such articles may actually help validate the behaviour of toxic bosses. In some cases, the writers have so little to say in support of their topic, that their article ends up being quite confusing. Take for example this Forbes article. The article is about the benefits of working with bad bosses, but 75% of the content actually sites good research that show why working with bad bosses is bad! In fact, I’m going to be referencing this article a lot in support of my topic. I’d like to believe every balanced person knows how to treat and respect the people they interact with. And if indeed you were going to learn social skills from a boss, you are much better off learning from a good leader. One basic reason for this is that we tend to behave like those around us; especially if they are in a position of authority. So there is a higher possibility that you may learn to treat people badly, if you have a boss who treats you badly. Since this claim uses military language, I’m going to tow the same line and use a military illustration. Imagine you are in the army and have been sent on a mission. For this mission, you need a team of soldiers, and you have been asked to choose one of two teams. The first team has a ton of experience fighting in the field against enemy combatants for several years, and with several successful missions in their portfolio; the second team has also seen some action, but they are most notable for having successfully endured “years of bullying and maltreatment” under a commanding officer who is now indicted. Which team will you place your life on? Of course this isn’t a hard decision (for non-suicidal people). Further evidence against this claim of benefits to employees can be seen in the results of just about every research into this topic. Clearly, those who claim that bad bosses produce competent employees, do so in spite of a mountain of research evidence that proves just the opposite. The leadership training company Zenger Folkman, conducted a study of 2,865 leaders in a large company. This study which was presented in a Harvard Business Review article, revealed that the most engaged, most committed, and happiest employees where under the supervision of those ranked as the best leaders. Conversely, the most miserable employees where being supervised by bad bosses. Is having a bad boss completely bad? Sadly, yes it is! No one benefits from constant criticism, bullying, squashing, etc. If you are in the situation, this may not be what you want to hear, but it is the fact. 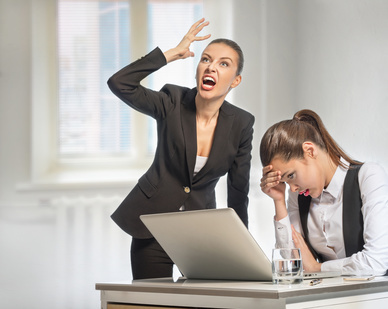 Of course you can find numerous help articles that show you how to “cope” with bad bosses. But do not be made to believe that you are benefiting somehow. Clearly, if you are in this situation, the best course of action is to learn to cope in the interim, while you frantically search for a job in a different department or company; and do this like your health and career depends on it. Well then again, they do.